Why have a three pickup Strat when you can have a four pickup Teisco Del Rey ‘Spectrum Four’? This blue meanie came into Guitars on George and we just had to have it. There’s just something fascinating about the off-brand guitars of the Sixties. For companies like Teisco (aka Tokyo Electronic Instrument and Sound Co.), the more buttons and knobs meant the better the sound. And check out the ‘bass’ and ‘treble’ labels on the pickups. Although the guitar shape is distinctively Strat-like, it also features a back bevel for the tremolo, similar to Rickenbackers. Other details include Vegematic pickup switches, spring-loaded bridge mute and a hippie-approved flower power pickguard. 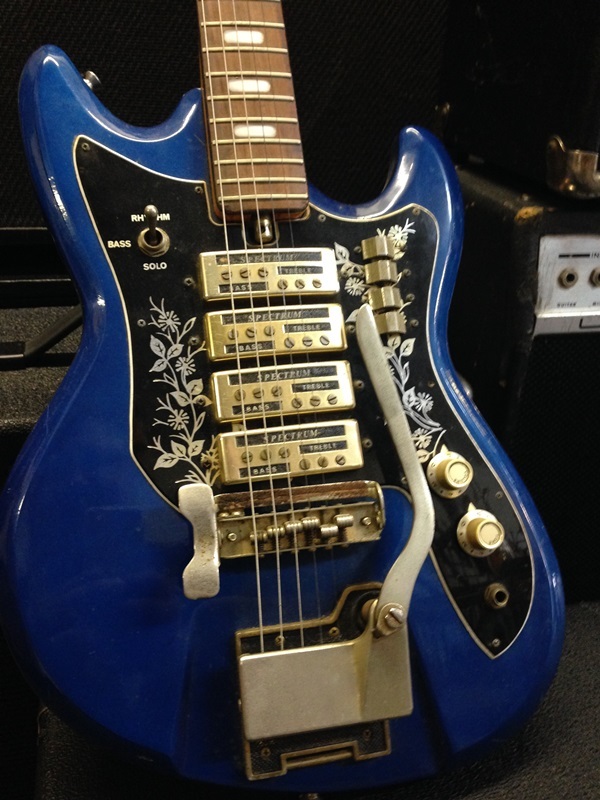 Because of the demand for Teisco pickups (which are gloriously trashy and sound great for slide guitar), many dealers are cannibalizing these classics and selling them part-by-part on eBay. We love these guitars too much to ruin them by parting them out.